本发明公开了一种聚氨酯包裹精油的微胶囊的制备方法，包括：将精油和异氰酸酯单体混合均匀，得到油相混合液；将油相混合液与含有无机粉末分散剂的水相混合液混合，在0～10℃下2000～8000r·min-1高速剪切均质化5～20min，得到含有液滴的微悬浮液；含有液滴的微悬浮液在扩链剂和催化剂的作用下，密闭反应1～3h，经后处理得到聚氨酯包裹精油的微胶囊。 The present invention discloses a method for preparing a polyurethane microcapsules of essential oils package, comprising: oil and isocyanate monomers uniformly mixed to obtain an oil phase mixture; the oil phase mixture containing inorganic powder with a dispersant aqueous phase mixture is mixed , at 0 ~ 10 ℃ 2000 ~ 8000r · min-1 high shear homogenization 5 ~ 20min, to obtain a suspension containing micro-droplets; fine suspension comprising droplets under the action of a catalyst and a chain extender, closed reaction 1 ~ 3h, the polyurethane wrapping was treated to afford essential oil microcapsules. 本发明采用无机粉末分散剂代替有机表面活性剂来乳化和分散油相混合液，并在界面聚合前使用低温高速剪切进行均质化预处理，使得得到的微胶囊粒径分布窄、平均粒径可控性强、反应体系稳定、精油含量高、包覆效率高、形态规整，适合于工业化大规模生产。 The present invention uses inorganic powder instead of the organic dispersant is a surfactant to emulsify and disperse the oil phase mixture, using low-temperature high shear homogenization pretreated prior to interfacial polymerization, the microcapsule so that a narrow particle size distribution obtained, the average grain path control, and stability of the reaction system, high oil content, high coating efficiency, regular shape, suitable for industrial mass production. 本发明设及精细化工中微胶囊的制备领域，尤其设及一种W无机粉末作为分散剂，经过低溫高速剪切均质化预处理，再通过界面聚合制备微米级精油微胶囊的方法。  The present invention is provided in the fine chemicals and preparation of microcapsules, in particular, provided W and an inorganic powder as a dispersant, after pretreatment of low-temperature high shear homogenizer, and then by interfacial polymerization micron microcapsules of essential oils method. 天然植物精油具有皮肤滋养、安抚烦躁、改善睡眠、促进血液循环、增强机能免疫力等作用。  Natural essential oils have skin nourishing, soothing irritability, improve sleep, promote blood circulation, strengthen the immune system function and so on. 然而，因为植物精油性质极不稳定易分解变质和散失挥发等问题，其发展应用受到很大制约，微胶囊技术能够保护植物精油免受外界环境影响，极大地改善了其稳定性和胆藏性，为植物精油的进一步开发利用提供了强有力的支撑。 However, because of the nature of essential oils extremely unstable and easily decomposed metamorphic loss of volatile issues, the development of applications has been greatly restricted, microencapsulation technology to protect essential oils from the external environment, which greatly improves the stability of Tibet and guts to provide a strong support for the further development and utilization of essential oils. 在两种互不相溶、分别溶解有两种单体的溶液的界面上(或界面有机相一侧）进行的缩聚反应叫做界面聚合。  In both immiscible were dissolved (organic phase or at the interface side) of the interface between the two monomers was carried out polycondensation reaction is called interfacial polymerization. 界面聚合具有反应快速、反应溫度低、包覆效率高、生成的囊壁致密性好等诸多优点，是制备微胶囊中最常用的制备方法之一。 Interfacial polymerization reaction with rapid, low reaction temperature, high coating efficiency, resulting wall good compactness and many other advantages, is the one most commonly used in the preparation of a microcapsule preparation. 例如授权公告号为CN101306341B的中国专利公开了一种界面聚合法制备相变储能微胶囊的方法，W油溶性烙点在10~80°C的有机相变材料为核屯、，W乙締基自由基单体为外壳聚合物，W水为聚合介质，W阴离子表面活性剂为乳化剂，W油溶性引发剂催化聚合反应，W磁力揽拌为乳化手段，通过界面聚合制备粒径分布在0. 2~5 ym范围内的相变微胶囊。 For example, authorized announcement No. 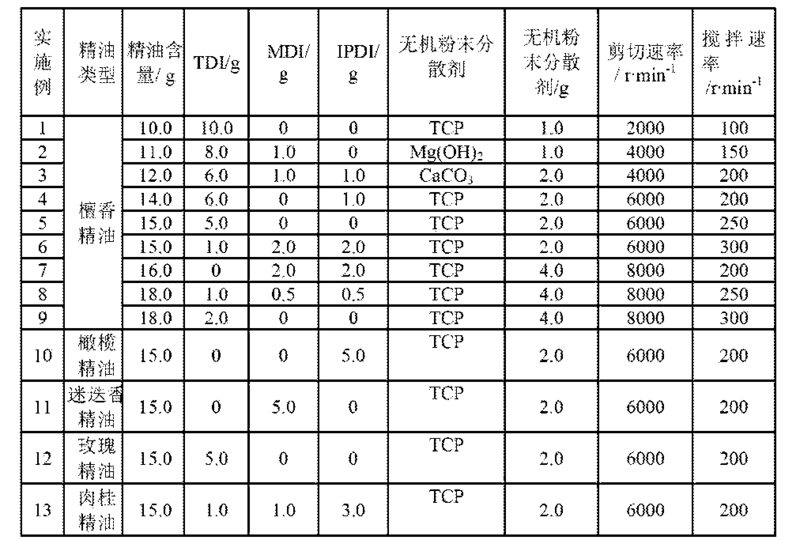 CN101306341B Chinese patent discloses a process for the preparation of interfacial polymerization phase change microcapsules, W branded point of an oil-soluble organic phase change material 10 ~ 80 ° C for the associated core Tun ,, W B radical polymer shell monomers, W aqueous polymerization medium, W emulsifiers anionic surfactant, W oil-soluble initiator catalyzed polymerization, W emulsion was magnetically stirred embrace means, prepared by interfacial polymerization of a particle size distribution phase change within the range of 0. 2 ~ 5 ym microcapsules. 授权公告号为CN101731210B的中国专利公开了界面聚合法制备农药微胶囊的工艺，包括：将不溶于水或在水中溶解度较低的农药有效成分溶解在甲苯或二甲苯中使其充分溶解形成有机溶液；加入与农药有效成分相匹配的乳化剂揽拌均匀，然后和甲苯二异氯酸醋混合形成有机相；将有机相倒入溶有水溶性单体和聚乙締醇作为分散剂的水溶液中，高速分散均质机剪切形成混合液；将混合液揽拌，使甲苯二异氯酸醋和水溶液单体充分反应；加入现有技术常用的增稠剂、防冻剂充分揽拌后，即得农药微胶囊水悬浮剂。 Authorized announcement No. CN101731210B Chinese patent discloses a process for the preparation of interfacial polymerization pesticide microcapsule, comprising: dissolving the water-insoluble or low solubility in water pesticide active ingredient sufficiently dissolved in toluene or xylene to form an organic solution ; emulsifier was added and the pesticide active ingredient football match mix well, and then toluene diisocyanate acid vinegar form an organic phase; the organic phase was poured into aqueous solution of water-soluble monomer and a polyvinyl alcohol as a dispersant associated in , high-speed shearing dispersing homogenizer mixture is formed; embrace the mixture was stirred, toluene diisocyanate, and vinegar acid monomers sufficient reaction solution; adding conventional prior art thickeners, antifreeze fully embrace the mix, i.e., pesticide microcapsule obtained aqueous suspension. W尿素代替多元胺、多元醇，W表面活性剂为乳化剂，制得了粒径在2~5 ym的微胶囊。 W urea instead of polyamine, polyol, surfactant emulsifiers W, diameter of the microcapsules was prepared in a 2 ~ 5 ym. 上述界面聚合制备微胶囊报道中，绝大多数体系都用有机表面活性剂来乳化分散油水混合液，制备的微胶囊粒径大多在50nm~10 ym之间。  The microcapsule interfacial polymerization prepared reported, most systems are organic surfactants to emulsify the dispersed oil-water mixture, particle size of the microcapsules produced mostly between 50nm ~ 10 ym. 有机表面活性剂虽然具有很高的乳化能力，但是其主要靠界面膜的形成，才能保持乳液的稳定。 Although the organic surfactant has a high emulsifying capacity, but mainly by the interfacial film is formed in order to maintain a stable emulsion. 界面聚合主要在界面处发生较剧烈的化学反应，会对界面膜有较大的破坏，同时也大大影响静电层的稳定。 Interfacial polymerization, more severe chemical reaction mainly at the interface, the interface will have a greater destruction of the film, but also greatly affect the stability of the antistatic layer. 因此，常规使用表面活性剂的界面聚合，其对体系配方和反应条件的要求较为苛刻，对反应过程的控制十分严格，如无法很好的控制住反应的速率，将极有可能引起反应体系的失稳。 Thus, the use of conventional surfactant interfacial polymerization, which requires the formulation of the system and the reaction conditions more stringent, control of the reaction process is very strict, as well control the reaction rate is not, the most likely cause of the reaction system instability. 本发明提供了一种聚氨醋包裹精油的微胶囊的制备方法，采用无机粉末分散剂代替有机表面活性剂来乳化和分散油相混合液，通过低溫高速剪切均质化预处理及室溫环境下的界面聚合，从而制得一种粒径分布窄、平均粒径可控性强、反应体系稳定、精油含量高、 包覆效率高、形态规整的微米级精油微胶囊。  The present invention provides a process for preparing a microencapsulated essential oil wrapped polyurethane vinegar, inorganic powder instead of the organic dispersant is a surfactant to emulsify and disperse the oil phase mixture, by low-temperature high shear homogenization pretreatment and interfacial polymerization at room temperature, thereby to prepare a narrow particle size distribution, average particle size control, and stability of the reaction system, a high oil content, high coating efficiency, regular form micron-sized microcapsules of essential oils. 3)步骤2)中含有液滴的微悬浮液在扩链剂和催化剂的作用下，密闭反应比~化， 然后经后处理得到聚氨醋包裹精油的微胶囊。  3) comprising Step 2) micro-droplets in suspension under the action of a chain extender and a catalyst to give reaction was then sealed package polyurethane vinegar essential oil microcapsules after treatment ratio of ~,. 步骤1)中，精油作为微胶囊的核屯、，异氯酸醋单体作为油相反应单体，混合后，即得油相混合液。  Step 1), the essential oils as a nucleus of the microcapsules,, Tun acid isobutyl acetate as the oil phase monomer reactive monomer, after mixing, to obtain an oil phase mixture. 步骤2)中，通过无机粉末分散剂来乳化和分散油相混合液，无机粉末分散剂在高速剪切均质化过程中有利于生成稳定的异氯酸醋单体/精油液滴。  Step 2) by dispersing the inorganic powder and dispersing agent to emulsify the oil phase mixture, the inorganic powder dispersant in a high shear homogenization process conducive to the formation of a stable acid isopropyl acetate monomer / oil droplets . 无机粉末分散剂适合高速剪切分散，不会像表面活性剂乳化体系那样在高速剪切时产生大量气泡（运些气泡极不利于油水相体系的乳化）。  The inorganic powder suitable for high-speed shearing dispersing the dispersant, not as large number of bubbles at high shear emulsifying surfactant system like (these bubbles is extremely unfavorable operational oil emulsion phase system). 无机粉末分散剂主要W内外双颗粒层结构形式附着于异氯酸醋单体/精油液滴周围。 W inside and outside the main structure of the inorganic powder particle dispersant bis acid isopropyl acetate layer is attached to the monomer / oil droplet around. 内层很薄，由少量极细小颗粒构成， 均一吸附于分散相表面，起到稳定液滴表面的作用，是控制单体液滴尺寸的关键。 Very thin inner layer composed of a small number of very fine particles dispersed uniformly adsorbed on the surface, acts stable droplet surface, it is a critical control monomer droplet size. 外层厚度远大于内层，主要由较大的颗粒及颗粒聚集体构成，主要通过提供机械阻隔作用来稳定分散相。 Much larger than the thickness of the inner layer, composed mainly of larger particles and aggregates of particles, primarily by providing a mechanical barrier effect to stabilize the dispersed phase. 即使是在进行较剧烈的界面缩聚反应时，其提供的强大机械阻隔力也可W很好的防止液滴聚并和形变，使得体系十分的稳定。 Even more dramatic is performing interfacial polycondensation, which provides a strong mechanical blocking force W may also be a good coalescence droplets and prevent deformation, such that the system is very stable. 在0°C~10°C下2000r.min1~SOOOr.min1 高速剪切均质化5min~20min。  at 0 ° C ~ 10 ° C 2000r.min1 ~ SOOOr.min1 high shear homogenization 5min ~ 20min. 由于异氯酸醋单体在高溫下较易与水发生反应，高速剪切过程中会产生大量的热量，极易使得异氯酸醋单体发生水解。 Since the acid isopropyl acetate monomer easily react with water at a high temperature, high shear process will produce a lot of heat, so that the easy isobutyl acetate monomer acid hydrolysis. 因此，在使用高速剪切的同时，必须保持体系〇°c~10°C的低溫状态，避免异氯酸醋不必要的水解。 Thus, while using high shear, low temperature systems must remain square ° c ~ 10 ° C, to avoid unnecessary iso vinegar acid hydrolysis. 常规的界面聚合法制备微胶囊体系中，大都采用普通的磁力揽拌或者错式揽拌奖揽拌来完成油水两相的乳化。  Conventional microcapsules prepared by interfacial polymerization system, most of the ordinary or the wrong type magnetic stirred embrace embrace embrace prize stirred to complete mix the two phases oil and water emulsion. 上述揽拌所提供的剪切力小、撕裂分散相的能力较弱，达到均质化平衡所需的乳化时间长，因此往往得到的产物粒径分布通常很宽，产物平均粒径大小甚至会有一个或几个数量级的差距。 Small shear forces, capability of the tearing embrace stirred provided the dispersed phase is weak, the length of time required to reach equilibrium emulsification homogenization time, the product thus obtained particle size distribution generally tends to vary widely, the average particle size product even or there will be a gap of several orders of magnitude. 因此，采用普通的揽拌均质化方法无法很好地调控微胶囊的粒径大小和分布。 Thus, using conventional homogenization methods can not embrace stirred well regulated particle size and distribution of the microcapsules. 本发明采用低溫高速剪切均质化工艺，可W在很短的时间内完成液滴的分散，并且2000r•min1~SOOOr•min1高速剪切均质化剪切强度很强，作用力均匀，形成的液滴粒径分布窄。 The present invention uses low-temperature high shear homogenization process, may be dispersed droplets of W is completed in a very short time, and 2000r • min1 ~ SOOOr • min1 high shear homogenization the shear strength of a strong, uniform force, forming a narrow droplet size distribution. 另外，通过控制剪切速率的大小和剪切时间的长短，就可W方便高效的在一定范围内对聚氨醋包裹精油的微胶囊的粒径进行调控。 Further, the size and duration of shearing time by controlling shear rate W can be convenient and efficient regulation of the particle diameter of the microcapsules of essential oils polyurethane vinegar wrapped within a certain range. 另外，通过调节体系均质化强度，可有效控制聚氨醋包裹精油的微胶囊的粒径。  Further, by adjusting the intensity homogenization system, which can effectively control the particle size of the microcapsules of essential oils wrapped polyurethane vinegar. 通常情况下，剪切速率越高、剪切时间越长，所得到产物的粒径越小。 Typically, the higher the shear rate, the longer the shearing time, the smaller the particle size of the resulting product. 在上述剪切均质化分散工艺下，所制聚氨醋包裹精油的微胶囊平均粒径一般在8ym~40ym，尺寸均一，体系稳定。 In the above-described shear homogenization dispersion process, average particle diameter of the microcapsules of essential oils prepared polyurethane wrapped vinegar is generally ~, uniform size, the system stabilizing 8ym 40ym. 步骤3)中，在催化剂作用下使得扩链剂和异氯酸醋单体密闭反应，生成聚氨醋，密闭反应可尽量减少精油的挥发，经过密闭反应Ih~化后，聚氨醋将精油液滴包裹起来，形成聚氨醋包裹精油的微胶囊。 In  Step 3), under the action of a catalyst and a chain extender such acid isopropyl acetate monomer sealed reaction to produce polyurethane vinegar, closed reaction can minimize volatile essential oil, sealed after the reaction of Ih ~, polyurethane the oil droplets wrapped vinegar, vinegar wrapped polyurethane forming microcapsules of essential oils. 步骤1)中，所述的精油可根据需要选用市场上现有的精油，所述的精油为檀香精油、橄揽精油、迷迭香精油、玫瑰精油、肉桂精油等中的一种或多种。  Step 1), the essential oil may need to use conventional oils on the market, the oil is sandalwood oil, olive oil, rosemary oil, rose oil, cinnamon oil, and the like in a or more. 上述精油稳定，不会与异氯酸醋单体发生化学反应，功效明显，亲油性强，是最常见、应用广泛的商品化植物精油。 Oil steady above, does not react chemically with different monomer acid vinegar, efficacy was significantly strong lipophilic, it is the most common and widely used commercial plant oils. 所述的异氯酸醋单体为甲苯二异氯酸醋（TDI)、二苯基甲烧二异氯酸醋（MDI)、异佛尔酬二异氯酸醋（IPDI)中的一种或多种。  The heterologous acid monomer is tolylene vinegar vinegar acid (TDI), diphenyl acetic acid for methane diisocyanate (MDI), isophorone diisocyanate pay vinegar acid (IPDI) in one or more. 上述的异氯酸醋单体能够与扩链剂发生反应， 形成聚氨醋，作为微胶囊的壳层。 The above acid isopropyl acetate monomer capable of reaction with a chain extender to form a polyurethane vinegar, as the shell of the microcapsules. 配方中精油与异氯酸醋单体的质量比对所制微胶囊的形态影响显著。 Morphology  mass with different formulations of essential oils vinegar acid monomer ratio of microcapsules made a significant impact. 当精油的质量为精油与异氯酸醋单体总质量的50%~80%范围内时，微胶囊壳层完整致密、精油包裹性好，同时微胶囊内异氯酸醋单体反应完全，可制得高精油含量、高品质的聚氨醋包裹精油的微胶囊。 When the oil quality is within the range of different oil and vinegar acid monomers total mass of 50% to 80%, microcapsule shell full dense oil good package, while different monomers vinegar acid microcapsules complete the reaction, can be obtained a high content of essential oil, high-quality polyurethane wrapped vinegar essential oil microcapsules. 当精油含量高于80%时，微胶囊囊壁较薄，抵抗外压能力较弱，且微胶囊壁层会有不少缺陷，微胶囊壁层完整性较差。 When the oil content is more than 80%, the microcapsule wall thin, weak resistance to external pressure, and the wall layer of the microcapsules have many defects, poor microcapsule wall layer integrity. 当精油含量低于50%时，异氯酸醋单体显著增多，微胶囊壁厚显著增大，液核内部的异氯酸醋单体与水相中扩链剂巧日乙二醇）反应的能力大大降低，因而，微胶囊液核内会不可避免地会残留有少量异氯酸醋单体。 When the content is less than 50% oil, vinegar acid monomers iso significantly increased, the wall thickness of the microcapsules increases significantly, the internal liquid core acid isopropyl acetate monomer in the aqueous phase coincidence date glycol chain extender) Reaction the greatly deteriorated, and therefore, the inner core microcapsule liquid will inevitably remain a small amount of acetic acid different monomers. 因此，本发明中，所述的精油的质量优选为精油与异氯酸醋单体总质量的50%~80%。 Accordingly, the present invention, the essential oil is preferably 50 mass% to 80 mass% of the total oil and vinegar acid different monomers. 步骤2)中，所述的无机粉末分散剂为活性憐酸=巧下简称TCP)、活性氨氧化儀下简称Mg (0H)2)、活性碳酸巧（W下简称化C〇3)中的一种或多种。  Step 2), the inorganic powder dispersion agent is an acid active Rei = clever hereinafter referred to as TCP), referred to as Mg (0H) 2), an active carbonate, ammonia oxidation activity under clever device (W abbreviation of the C〇3 one or more) of. 上述S种无机粉末分散剂粉末细腻，分散效果好，并且性质稳定、相近，同时，上述=种无机粉末分散剂是工业生产中最常用的几种分散剂，适合工业化大规模生产。 S above inorganic fine powder, powder dispersants, good dispersion and stable, close, while the inorganic powder = dispersants are most commonly used in industrial production several dispersants, suitable for industrial mass production. 因此，本发明选用上述=种无机粉末分散剂作为优选的分散剂。 Accordingly, the present invention selects the above-described inorganic powder dispersant = as preferred dispersant. 所述的无机粉末分散剂的粒径优选为lOOnm~500nm。 The inorganic dispersant powder particle size is preferably lOOnm ~ 500nm. 所述的无机粉末分散剂的质量为精油和异氯酸醋单体总质量的3%~10%。  The mass of the inorganic powder dispersing agent is 3% to 10% of the total mass of the oil and vinegar acid iso monomers. 无机粉末分散剂的用量要足够稳定生成的异氯酸醋单体/精油液滴，但是过多的无机粉末分散剂会减弱体系的稳定性，同时也造成不必要的浪费。 The amount of the inorganic dispersant to the powder sufficiently different acid monomers vinegar / oil droplets stably generated, but the excessive inorganic powder dispersant will weaken stability of the system, also resulting in unnecessary waste. 当无机粉末分散剂的用量<3% (占精油和异氯酸醋单体总质量)时，其无法稳定剪切产生的液滴；当无机粉末分散剂的用量>10% 时，多余的无机粉末分散剂使得异氯酸醋单体/精油液滴过小、微胶囊粒径分布变宽，并且无机粉末分散剂会发生团聚，使得体系中存在一些较大的颗粒杂质，反而造成了异氯酸醋单体/精油液滴有了一定程度的聚集，进而导致反应体系的不稳定。 When the amount of the inorganic powder dispersing agent <3% (on oil and vinegar acid isopropyl total monomer mass) which is not stable droplet shearing; When the amount of the inorganic dispersant powder> 10%, excess inorganic acid isopropyl powder dispersion agents such monomers vinegar / oil droplets is too small, the microcapsule particle size distribution becomes broad, and the inorganic dispersant may agglomeration of the powder, so that there is some larger particulate impurities in the system, instead of an exclusive-chloro monomer vinegar / oil droplets have a certain degree of aggregation, leading to instability of the reaction system. 所用无机粉末分散剂惰性无毒，留在微胶囊产物中可作为填料物质，能够起到膨化产物、增大微胶囊与外界环境接触面等作用。 An inert, non-toxic inorganic powder dispersant, the microcapsules remain in the product as a filler material, can play a puffed product, increasing the effect of the microcapsules with the environment, etc. used in the contact surface. 含有无机粉末分散剂的水相混合液至少包括无机粉末分散剂和水，其中，对水含量没有严格的要求，水含量能够使异氯酸醋单体/精油液滴分散在水中即可，可W采用本领域技术人员知晓的常量。  Water containing inorganic powder with a dispersant mixture comprising at least an inorganic powder dispersant and water, wherein there is no strict requirements for water content, the water content can be made different acid monomers vinegar / oil droplets dispersed in water, i.e., can, W can be employed known to a person skilled in the art constants. 所述的高速剪切均质化采用冰水浴冰镇，溫度为0°C~：TC，采用冰水浴冰镇，保持(TC~：TC的低溫状态。异氯酸醋单体在高溫下较易与水发生反应，高速剪切过程中会产生大量的热量，极易使得异氯酸醋单体发生水解。因此，在使用高速剪切均质化的同时，全程使用冰水浴降溫，保持体系的低溫状态，能够很好地避免异氯酸醋不必要的水解。  The high shear homogenization using an ice water bath chilled temperature of 0 ° C ~: TC, using iced ice-water bath, holding (TC ~:. Low temperature TC of different acid monomers at a high temperature of vinegar easily react with water, a high shear process will produce a lot of heat, so that the easy isobutyl acetate monomer acid hydrolysis. Thus, while using high shear homogenization, the entire cooling using an ice water bath, maintained low temperature system can be good to avoid unnecessary heterologous vinegar acid hydrolysis. [00巧]步骤3)中，所述的扩链剂为聚乙二醇，所述的催化剂为=乙締二胺，在=乙締二胺的催化下，扩链剂聚乙二醇与异氯酸醋单体发生界面聚合，形成聚氨醋，作为微胶囊的壳层，壳层完整性好。 [Qiao 00] In step 3), said polyethylene glycol chain extender, the catalyst is a diamine association = B, B = catalyst in association diamine, polyethylene glycol and chain extender acid isopropyl acetate monomer in the interfacial polymerization to form a polyurethane vinegar, as the shell of the microcapsules, the shell good integrity. [00%] 所述的异氯酸醋单体与扩链剂的质量比为1 :0. 5~2. 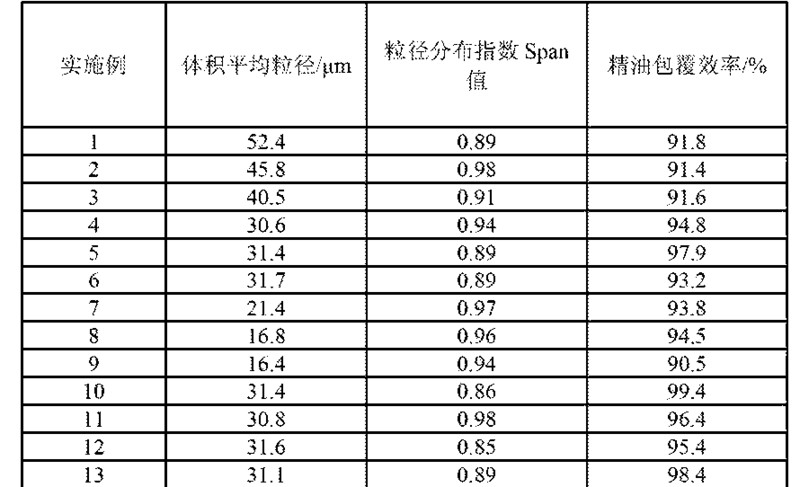 5,有利于界面聚合生成壳层完整性好的微胶囊。 [00%] of the different mass of the acid monomer and chain extender vinegar ratio of 1: 05 ~ 25, facilitate good interfacial polymerization of the integrity of the microcapsule shell. 所述的催化剂的用量可采用本领域技术人员知晓的少量，作为优选，所述的异氯酸醋单体与催化剂的质量比为1 :〇. 0005~0. 005,进一步优选，为1 :0. 001~0. 005,能够很好地促进反应。 The amount of the  catalyst can be employed known to those skilled in small amounts, preferably, the mass of the iso vinegar acid monomer to catalyst ratio of 1: 0005 ~ 0005 square, more preferably, 1: 0001 - 0005, to promote the reaction well. 所述的密闭反应的溫度为15°C~35°C，有利于界面聚合，形成聚氨醋，作为微胶囊的壳层，包裹精油，壳层完整性好。 A closed reaction temperature of the  of 15 ° C ~ 35 ° C, favor the interfacial polymerization to form a polyurethane vinegar, as the shell of the microcapsules, oil parcel, good integrity of the shell. 反应溫度过低，反应单体运动能力和反应活性减弱，会降低反应速率、影响反应彻底程度；反应溫度过高，反应速率过快，会影响壁材的完整性，同时还会加剧精油的挥发程度。 The reaction temperature is too low, the reaction monomer and reactivity decreased exercise capacity, will reduce the rate of reaction, reaction thoroughness; the reaction temperature is too high, the reaction rate is too fast, it will affect the integrity of the wall material, but also exacerbate the volatile essential oils degree. 所述的密闭反应的溫度进一步优选为25°C，密闭反应的时间进一步优选为1.化。 Said closed reaction temperature is more preferably 25 ° C, the reaction time is more preferably a sealed 1. of. 密闭反应过程中W15化•min1~30化•min1速率揽拌。  closed during the reaction of W15 • min1 ~ 30 • min1 rate of mixed embrace. 揽拌速率对含有液滴的微悬浮液的悬浮稳定十分重要，界面聚合需要保持微米级异氯酸醋单体/精油液滴较好地悬浮在连续相中。 Embrace stirred suspension stabilizing rate of the suspension containing micro-droplets is important, the need to maintain the interfacial polymerization micron isopropyl acid monomers vinegar / oil droplets preferably suspended in a continuous phase. 反应时的揽拌速率对形态的影响主要体现在对微胶囊的球形度和团聚程度影响巨大，过快的揽拌速率会使得微胶囊的球形度变差，并且发生一定程度的聚集，过慢的揽拌速率将不足W使异氯酸醋单体/精油液滴稳定悬浮在连续水相中。 Effect embrace the reaction rate when mixed form mainly of spherical and degree of agglomeration of microcapsules great influence, excessive mixing rate is such that embrace sphericity of the microcapsules is deteriorated, and a degree of aggregation occurred, slow the mixing rate is less than W embrace so isobutyl acetate monomer acid / oil droplets stably suspended in the continuous aqueous phase. 当揽拌速率〉30化•min-i时，界面聚合过程中液滴易团聚，体系易失稳。 When mixed with olive rate> 30 of • min-i, droplet interfacial polymerization process easy to join, easy to system instability. 而揽拌速率<150r•min1时， 揽拌提供的悬浮作用较弱，含密度较大的无机粉末的分散相会有一定程度的降沉现象，运会进一步导致反应体系部分失稳，产物粒径分布急剧变宽。 Embrace the mix rate <When 150r • min1, stirred suspension effect embrace provide weaker, containing dispersed inorganic powder of higher density will sink down a certain degree of the phenomenon, the reaction system may further result in operational instability portion, granulate the products size distribution widened sharply. 所述的后处理包括冷却、抽滤W及干燥，最后得到的聚氨醋包裹精油的微胶囊为粉体。  The post-treatment comprises cooling, filtered off with suction and dried and W, the resulting polyurethane wrapped vinegar essential oil microcapsules powder. 本发明中，所述的剪切、揽拌、洗涂、抽滤等均为化工过程中的典型单元操作，可采用现有的常规装置实现。  In the invention, the shearing, embrace mix, wash coating, filtration and the like are typical in the chemical process unit operation, the conventional apparatus may be employed conventional implementation. 一、本发明在常规聚氨醋界面聚合的基础上，通过使用W无机粉末分散剂替代常规、难W去除的表面活性剂来乳化和分散油相液滴，不仅可大大改善反应体系的稳定性，更可获得形态良好的微米级聚氨醋包裹精油的微胶囊。  First, the present invention is based on the conventional interfacial polymerization of the polyurethane vinegar, W by using an inorganic powder instead of conventional dispersants, surfactants W difficult to remove emulsified and dispersed droplets of the oil phase, the reaction system can be greatly improved not only stability, more favorable morphology is obtained micron polyurethane wrapped vinegar essential oil microcapsules. 二、本发明对油相混合液进行低溫高速剪切均质化工艺预处理，大大缩短了常规揽拌乳化油水混合相的时间，同时也提高了所形成液滴尺寸的均一性，避免了常规揽拌乳化带来的产物粒径分布过宽、不易控制粒径大小等问题，使得制备得到了微胶囊粒径分布窄，粒径大小简单可控。  Second, the present invention is the oil phase mixture to high shear homogenization at low temperature pretreatment process, greatly reducing the oil-water emulsion mix embrace conventional mixing time phases, but also improve the uniformity of the droplet size formed, to avoid the conventional product brings embrace mixed emulsified particle size distribution is too wide and difficult to control particle size and so on, so that the prepared microcapsule narrow particle size distribution, particle size simple and controllable. =、本发明所用无机分散剂惰性无毒，所制产物为高分散性的微米级微悬浮液，在常溫下经简单过滤，即可制得均匀稳定白色粉体。 An inert, non-toxic inorganic dispersant  =, the present invention is used, the prepared product is highly dispersed micron-sized fine suspension by simple filtration at room temperature, to obtain a uniform and stable as a white powder. 运些粉体可方便地作为添加剂和填充物， 直接用于纺织、建筑、家具等领域的芳香整理。 These powders can be easily transported as additives and fillers used directly in the field of fragrance finishing textile, construction, furniture and the like. 四、本发明所用原料易得，工艺简单，微胶囊形态结构的可控性好，不设及有机溶剂，过程无溶剂污染等问题，可避免使用表面活性剂所产生的后期难去除、反应体系不稳定、精油包覆率不高等问题。  Fourth, the present invention is easily available raw materials, simple process, controllable microcapsule morphology good, no organic solvent, the process solvent-free pollution problems, avoiding the use of a surfactant produced late with difficult to remove The reaction system is unstable, oil-coated rate not high. 本方法适合于工业化大规模生产。 This method is suitable for industrial mass production. 图5为实施例5制备的聚氨醋包裹精油的微胶囊的粒径分布图。  FIG. 5 is a particle size distribution of the microcapsules of essential oils wrapped polyurethane vinegar is produced in Example 5. 3)向步骤2)中含有液滴的微悬浮液中加入5g聚乙二醇（PEG-4000)，转移到25°C 的密闭环境下，在25°C恒溫水浴中密闭揽拌反应1.化，揽拌速率为20化•min1，然后经冷却、抽滤W及干燥，得到聚氨醋包裹精油的微胶囊，为粉体。  3) comprising the step 2) micro-droplets in the suspension were added 5g of polyethylene glycol (PEG-4000), proceeds to the enclosed environment of 25 ° C, 25 ° C in a sealed embrace thermostatic water bath in the mix the reaction of 1, embrace mix rate of 20 • min1, then cooled, filtered off with suction and dried W, to obtain vinegar wrapped polyurethane microcapsules of essential oils, as a powder. 其它实施例操作过程同上，需改变的工艺参数和配方见表1，聚氨醋包裹精油的微胶囊的部分表征结果详见表2。  Other process embodiments above operation, need to change the formulation and the process parameters shown in Table 1, the results of characterization part vinegar wrapped polyurethane microcapsules of essential oil are shown in Table 2. 通过激光粒度仪(英国Malvern公司产Mastersize;r-2000激光粒径仪）测量聚氨醋包裹精油的微胶囊的粒度，得到其平均粒径值和粒径分布指数Span值；通过冷场发射扫描电镜（FE-SEM)透射电镜(德国Zeiss公司ULTRA55)观察聚氨醋包裹精油的微胶囊粉末的形态结构；通过热失重分析(美国PE公司的Pyrisl型热重分析仪）分析聚氨醋包裹精油的微胶囊中被包裹精油的含量，升溫速率为20°C /min,升溫区间为0~700°C。  by a laser particle size analyzer; microcapsule size (Malvern, UK production Mastersize r-2000 laser particle size analyzer) measurement vinegar wrapped polyurethane essential oil, to give an average particle size and particle size distribution index value Span value; by cold field emission scanning electron microscope (FE-SEM) TEM morphology of the microcapsule powder (ULTRA55 Zeiss, Germany) was observed vinegar wrapped polyurethane essential oil; vinegar analyzed by thermogravimetric analysis polyurethane (PE's U.S. Pyrisl thermal gravimetric analysis) wrapping essential oil microcapsules is encapsulated essential oil content, a heating rate of 20 ° C / min, temperature rise range is 0 ~ 700 ° C.
 实施例5制备的聚氨醋包裹精油的微胶囊的扫描电镜（SEM)照片如图1所示，从图中可W看出，微胶囊球形度良好，分散均匀，粒径大小均在微米级。 Vinegar wrapped polyurethane microcapsules of essential oil  Example 5 Preparation of a scanning electron microscope (SEM) photograph 1, W can be seen from the figure, the microcapsules good sphericity, uniform dispersion particle size was in micron. 阳化5] 实施例9制备的聚氨醋包裹精油的微胶囊的扫描电镜（SEM)照片如图2所示，从图中可W看出，发现大量未成形的胶囊囊皮，囊皮之间粘连较严重。 Yang 5] Example 9 microcapsules of essential oils prepared polyurethane wrapped vinegar scanning electron microscope (SEM) photograph shown in Figure 2, W may be seen from the figure, it was found a large amount of unformed capsule shell capsules, the capsule shell adhesions between more serious. 实施例8制备的聚氨醋包裹精油的微胶囊与实施例9基本一致。 Vinegar wrapped polyurethane essential oil microcapsules prepared in Example 8 and Example 9 are basically the same. 由于实施例8和实施例9中，精油的质量为精油与异氯酸醋单体总质量的90%，无机粉末分散剂的质量为精油和异氯酸醋单体总质量的20%。 Since Example 8 and Example 9, the oil is 90 mass% of the total mass of the oil and vinegar different acid monomers, mass of the inorganic powder dispersant is 20% of the total mass of the oil and vinegar acid iso monomers. 精油的质量为精油与异氯酸醋单体总质量的90%，高于80%，微胶囊囊壁较薄，抵抗外压能力较弱，且微胶囊壁层会有不少缺陷，微胶囊壁层完整性较差。 Oil is 90 mass% of the total mass of the oil and vinegar different acid monomers, greater than 80%, the microcapsule wall thin, weak resistance to external pressure, and the wall layer of the microcapsules have many defects, microcapsules poor parietal integrity. 无机粉末分散剂的质量为精油和异氯酸醋单体总质量的20%，高于10%，多余的无机粉末分散剂使得异氯酸醋单体/精油液滴过小、微胶囊粒径分布变宽，并且无机粉末分散剂会发生团聚。 Mass dispersant inorganic powder is 20% of the total mass of the oil and vinegar acid iso monomers higher than 10%, the excess inorganic powder dispersant such heterologous acid monomers vinegar / oil droplets is too small, particle size of the microcapsules distribution becomes broad, and the inorganic dispersant may agglomeration of the powder. 因此，无法形成壳层完整致密、精油包裹性好的微胶囊。 Therefore, it can not form a complete shell compact, encapsulated essential oil microcapsules good. 实施例5制备的聚氨醋包裹精油的微胶囊通过70°C烘赔24h后粉末样品的扫描电镜（SEM)照片如图3所示，从图中可W清晰的看到液核挥发后的中空微胶囊，胶囊囊壁收缩塌陷，说明油相被较好地包覆在微胶囊内部。 Vinegar wrapped polyurethane microcapsules of essential oils  Preparation Example 5 by 70 ° C after 24h drying powder samples lose SEM (SEM) photograph as shown in FIG clearly seen from FIG liquid core may be W 3 after evaporation of hollow microcapsules, capsules shrinkage wall collapse, the oil phase is well described within the coated microcapsules. 同时，图3破裂微胶囊囊壁很好地显示了壳层的致密性。 Meanwhile, the microcapsules rupture FIG. 3 shows a very dense wall of the shell. 实施例1制备的聚氨醋包裹精油的微胶囊的热重分析（TGA)曲线如图4所示。 Thermogravimetric analysis vinegar wrapped polyurethane microcapsules of essential oils  Preparation Example 1 (TGA) curve as shown in FIG. 实施例5制备的聚氨醋包裹精油的微胶囊的粒径分布图如图5所示。 Particle size of the microcapsules of essential oils wrapped polyurethane vinegar  Example 5 Preparation of profile shown in Figure 5. 通过红外光谱对实施例5制备的聚氨醋包裹精油的微胶囊进行成分分析，其含有聚氨醋和檀香精油，并结合其扫描电镜照片可知，微胶囊的壳层为聚氨醋，壳层完整性好。  by infrared spectroscopy Example 5 wrapped polyurethane vinegar essential oil microcapsules prepared component analysis, polyurethane containing vinegar and sandalwood oil, combined with a scanning electron micrograph which shows that the microcapsule shell is a polyurethane vinegar, good shell integrity. 1. 一种聚氨酯包裹精油的微胶囊的制备方法，其特征在于，包括以下步骤： 1) 将精油和异氰酸酯单体混合均匀，得到油相混合液； 所述的精油为檀香精油、橄榄精油、迷迭香精油、玫瑰精油、肉桂精油中的一种或多种； 2) 将步骤1)中的油相混合液与含有无机粉末分散剂的水相混合液混合，在0°C~3°C 下2000r.min1~8000r.min1高速剪切均质化5min~20min，得到含有液滴的微悬浮液； 所述的无机粉末分散剂为活性磷酸三钙、活性氢氧化镁、活性碳酸钙中的一种或多种； 所述的高速剪切均质化采用冰水浴冰镇； 3) 步骤2)中含有液滴的微悬浮液在扩链剂和催化剂的作用下，密闭反应Ih~3h，然后经后处理得到聚氨酯包裹精油的微胶囊； 密闭反应过程中以150r•min1~300r•min1速率搅拌； 所述的密闭反应的温度为15°C~35°C。 The method of preparing polyurethane microcapsules A package essential oil, characterized in that it comprises the following steps: 1) the oil and isocyanate monomers uniformly mixed to obtain an oil phase mixture; Sandalwood oil is the essential oil, olive oil , rosemary oil, rose oil, cinnamon oil of one or more; 2) oil step 1) in aqueous phase mixture containing inorganic powder with a dispersant phase mixture is mixed at 0 ° C ~ 3 ° C 2000r.min1 ~ 8000r.min1 under high shear homogenization 5min ~ 20min, to obtain a suspension containing micro-droplets; said inorganic powder is dispersed active agent is tricalcium phosphate, the activity of magnesium hydroxide, calcium carbonate one or more; the high shear homogenization using an ice water bath chilled; 3) step 2) contains a fine suspension of droplets under the action of a catalyst and a chain extender, closed reaction Ih ~ 3h and then wrapping the polyurethane obtained after treatment essential oil microcapsules; closed during the reaction to 150r • min1 ~ 300r • min1 stirring rate; the temperature of the reaction is closed 15 ° C ~ 35 ° C.
2. 根据权利要求1所述的聚氨酯包裹精油的微胶囊的制备方法，其特征在于，步骤1) 中，所述的异氰酸酯单体为甲苯二异氰酸酯、二苯基甲烷二异氰酸酯、异佛尔酮二异氰酸酯中的一种或多种。 The method for preparing microcapsules polyurethane wrapping essential oils according to claim 1, wherein in step 1), the isocyanate monomer is toluene diisocyanate, diphenylmethane diisocyanate, isophorone One or more of the diisocyanates. 3. 根据权利要求1所述的聚氨酯包裹精油的微胶囊的制备方法，其特征在于，步骤1) 中，所述的精油的质量为精油与异氰酸酯单体总质量的50%~80%。 3. The method for preparing polyurethane microcapsules of essential oils according package according to claim 1, wherein in step 1), the mass of the oil is 50% to 80% of the total mass of oil and isocyanate monomers. 4. 根据权利要求1所述的聚氨酯包裹精油的微胶囊的制备方法，其特征在于，步骤2) 中，所述的无机粉末分散剂的质量为精油和异氰酸酯单体总质量的3%~10%。 The method for preparing the microcapsules of the essential oil of the polyurethane wrapping claimed in claim 1, wherein in step 2), the mass of the inorganic powder as the dispersing agent and the total mass of the isocyanate monomers oil 3% to about 10 %. 5. 根据权利要求1所述的聚氨酯包裹精油的微胶囊的制备方法，其特征在于，步骤3) 中，所述的扩链剂为聚乙二醇，所述的催化剂为三乙烯二胺。 5. The polyurethane according to claim 1 preparing microcapsules of essential oils wrapping, wherein, in step 3), said polyethylene glycol chain extender, the catalyst is triethylenediamine.